A girl for all seasons: A toy no single woman should be without! Being a single woman there was one vital task that I felt I could not complete properly without the assistance of a man. But there wasn't always one around when I needed him. So I have just purchased a miracle new toy to do it for myself! It runs on batteries and vibrates at a remarkable speed. It has a long and pulsating shaft. In case of over use, it comes with a five year guarantee. I had wanted one in pink but it wasn't available. Regardless of its colour, the nice man in the shop said it would keep my bush under control and in good shape. Girls, do yourself a favour. Don't depend on the man in your life to step up to the mark every time. 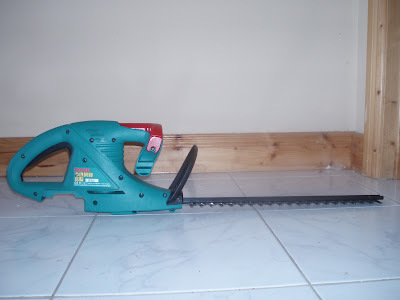 Bosch AHS 41 ACCU Hedge Trimmer!